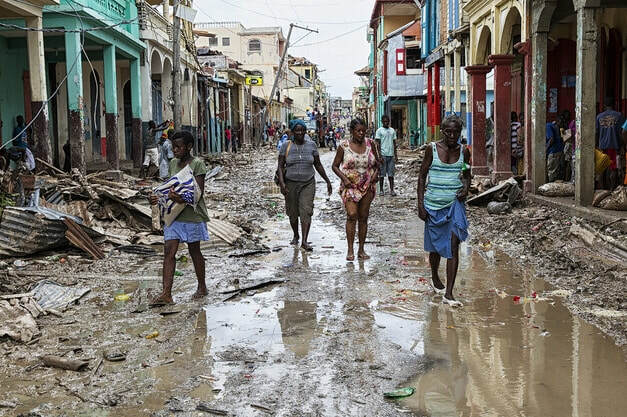 On October 4, 2016 a Category 4 hurricane struck the already struggling island of Haiti invoking further devastation. The Haitian government officially issued a red alert requesting the assistance of the United Nations and its support mechanisms. From a reproductive health standpoint, Haiti is one of the more devastating countries in the world. The current maternal mortality rate (MMR) in Haiti is 359/100,000 and is 25 times higher than the United States at 14/100,000. Even the Dominican Republic, which shares the Eastern half of the island, has a much lower rate of maternal deaths. The Lifetime Maternal Death rate is 1:90. This means that 1 in every 90 baby girls born this year in Haiti will eventually die before the age of 50 of maternity related causes. It is estimated that only 39% of women in Haiti have a skilled birth attendant at their birth. Midwife Pilgrim was able to send trained midwives to one particularly hard hit area providing reproductive health and midwifery services. In the spring of 2015 we were asked to develop a curriculum to teach Community Health Workers and Traditional Birth Attendants in Sierra Leone safe birth practices within the Ebola climate. We provided a clear curriculum, resources, and referred midwives as trainers to ensure birth attendants as well as pregnant women and infants would no longer be the first to perish during this time of great crisis. Sierra Leone has one of the highest maternal and neonatal mortality rates in the world. Even before Ebola struck the outlook was bleak for women and infants with 1 in 17 chance that a woman would die from a maternal related cause. Ebola has made that statistic more devastating, but we still do not know the extent. As first responders, midwives were among the first to die from Ebola before anyone understood the situation. In fact, even at the peak of the epidemic, midwives often were the only ones willing to care for women during their pregnancy and childbirth and many lost their lives due to their compassion and dedication. Our curriculum took into account community needs as well as the most likely causes for mortality/morbidity among this population. In working in collaboration with the health care workers and not dictating to them how things must change, we are hopeful more lives will be saved.